If there’s one thing that goes with good fresh food, like that which you’ll find at the Whistler Farmers Market, it’s wine. And we have some outstanding wine vendors selling delicious BC wine. We will briefly explain the laws in regards to selling wine at the farmers market. Lastly, we will introduce you to a few wine vendors that will be attending our farmers market events. First, let’s get acquainted with wine in BC. Making wine in British Columbia is nothing to yawn at. It’s a major player in the BC economy, bringing nearly $3 billion every year to it. Of these five, Okanagan is the premier growing region for grapes. But all five collectively contain the 929 vineyards and wineries that bring in 1 million visitors to BC every year. It was declared on June 21, 2014, that all legal forms of alcohol – beer, wine, cider and spirits – can be sold at BC farmers markets, right alongside fruits and vegetables. Both the licensees and the markets have legal requirements to meet so that wine can be sold at the farmers markets. All sampling and sales of any liquor, wine included, must take place within the defined sales area at the market where the wine will be sold. Immigrants from Holland, Rolf de Bruin and Heleen Pannekoek founded Fort Berens in 2005 and fully launched the vineyard in 2009, which made it the very first in Lillooet. When it comes to techniques, it offers the latest ones, along with a vast, trusted network of growers and suppliers – another exciting addition to the Whistler Farmers Market. Forbidden Fruit Wine has the distinction of being an organic vineyard, ever since its inception in 1977. It was officially certified as such in 1984. The quality is also indicative of where the grapes are planted: A sloping hill that borders the Similkameen River. Well-watered and protected from the commercial farms, makes their fruit some of the best around, and it has been that way for four decades. Though the word “forbidden” is in their name, they won’t be forbidden from the Whistler Farmers Market. These are just a few of the wine vendors at our farmers market. Whatever your taste for food, wine or music, we are confident you will enjoy yourself at the Whistler Farmers Market. We hope to see you there! If you love fresh produce, you may have found yourself in the middle of a debate. Should you buy your fruits and vegetables at the supermarket, or at the farmers market? We’d like to tell you a little bit about us at Whistler Farmers Market. First, we are a non-profit organization, with our board of directors as the governing force. Marketwurks Management, Inc. manages and produces our farmers market events. Our corporate culture is summed up in two words: “Social responsibility”, a phrase that we and our market family have adopted and live by. In so many tangible ways we have demonstrated this social responsibility. Most outstandingly, because of our commitment to supporting local organizations, the Board of Directors approved donating a total of $10,000 yearly. Recent years have seen an increase in farmers market events. Some are even held on a weekday, besides the traditional Saturday slot. And now let’s look at a small list of benefits to shopping local. More affordable. The foods you buy at the farmers market go straight from the farmer to your hands. You don’t have to worry about all the middleman hands that add cost to what you buy in the store. Survival of the family farm. Family farms are a dying breed, and they need us to survive. Farm operating costs are high. When we buy local from a farmers market, we’re giving them support. Freshness. Your store-bought tomatoes may have come from across the country, preserved inside a refrigerated truck. Farmers market produce may have been picked the same morning it was sold. How fresh is that? Let’s now take a look at the part of the picture with the most impact on you and your family: Some benefits of eating local produce. Organic growing. Local family farmers don’t mess with GMO or steroids. The produce you buy from the family farm is sure to be as nature intended it to be. Maximized ripeness. The produce you buy from a farmers market is usually picked at its ripest point, or close to it. For this reason, it will taste the best. The difference is noticeable. Most nutritious. Because the produce is picked at ripeness, it will also be the most nutritious. And what’s the point of eating vegetables that lack natural nutrition? Of course, where would Whistler Farmers Market be without our vendors, who continue putting out high quality, fresh fruits and vegetables? Most of the time, we have around 90 vendors at our farmers market events. If you’ve never bought produce at a farmers market, we have to say that the only way to judge it fairly is to try it. If you’re in the South West BC area, come on out and pay us a visit. We hope to see you soon. Whistler Farmers Market understands, and is ready to report the BC produce status. In this article we will show you what’s available in general, for June, and then for the coming week. What's In Season At The Whistler Farmers Market? At the time of this writing, the latest info about available seasonal produce came for the week of June 25th. Otherwise, we do anticipate a good harvest this year. It’s “business as usual” and we just want to give you a heads up so you can get your favourite produce. So now let’s take a look at what you can expect to see for the rest of June. This year, strawberries and greens are the main goods to look out for in June. However, there are a host of others that are commonly available too. As far as fresh vegetables, there are beets, broccoli, cauliflower, carrots, cucumbers (long English, field and pickling), fennel, fresh garlic, kohlrabi, garlic scapes, green onions, radishes, rhubarb, salad turnips, cherry tomatoes and zucchini. You can get leafy greens like kale, lettuce, mustard greens, Swiss chard, herbs and spinach. Many of these vegetables and greens will continue to be harvested through the summer, some of them slightly beyond summer. Of course, we can’t forget fruits, and those things include cherries, blueberries, raspberries and strawberries. No doubt about it – this year’s harvest is definitely going to be a busy one! June will bring in the beginning of about 20 different vegetables and 3 fruits – all of those being berries. And that is just the tip of the iceberg. The pace will pick up in July with the harvesting beginning for even more fruits and vegetables. And all of those mentioned here will continue being harvested through the summer and beyond, while still others will be added to the mix. So whether it’s fruits or vegetables, you can be sure that this year’s harvest should have something everyone, including you! Here we are in the month of June, and for us at Whistler Farmers Market, June means it’s salad month. You might eat a salad any other time of the year, but June is a good month to bring some attention to it. That’s because salad greens are one of the items of BC produce we’re harvesting this month. So, in honour of Salad Month, we will include our top 5 salad recipes. This recipe is the most summer-appropriate, as it’s fresh and cool. It’s also versatile. You can mix and match ingredients to your personal liking. Your ingredients are lettuce, fresh spinach, tomatoes, radishes, celery, cucumber, and peppers. Take a salad bowl and start by tearing up lettuce into it. Add leaves of fresh spinach. Cut tomatoes to your ideal size, whether slices, chunks, etc. Then slice radishes, celery, cucumber and peppers into bite-size pieces. Add all to bowl. Toss salad and serve with your favourite creamy dressing or vinaigrette. Some like to add diced or shredded meat for an even heartier salad. This delicious salad can be served as a light meal or a side dish for a family gathering. Ingredients are simple: 20 ears of corn, 6 farmers-market fresh tomatoes, oil, salt, pepper and paprika. So you have some grilled corn left over, save it for this fresh recipe. This too could serve as a light meal, but it’s definitely a crowd pleaser as a side. If you have heirloom tomatoes and farmers market beets, which are in season this month, then you have a gastrointestinal fiesta with this salad. Many of the ingredients for this warm salad are in season this month! All you need to do is get some shrimp! Now that we’ve supplied you with our top 5 recipes, we’d like to hear from you. We invite you to share your favorite recipes you made with the Whistler Farmers Market ingredients. You can do this by tagging us on either Instagram or through Facebook, using this tag: @whistlerfarmersmarket. We hope you found this article interesting, in particular, the 5 recipes we linked you too. Don’t forget to comment and share your recipes too! Music is good for the soul. We feel it is good for the farmers market as well. Music, even live music, can either energize or relax our visitors, making for a pleasant overall experience. This is why we have a wide variety of entertainers to perform at our events. In this article, we will introduce you to some of them. But we will also provide links, so you can learn more about our market music providers. Live entertainment is a great way to create a fun, enjoyable atmosphere. While you’re shopping for Whistler Farmers Market’s best fruits and vegetables to take home to your kitchen, great music will be playing. Plus, if you need a break from shopping, or you’re done shopping, then you can take in just the live music, especially if the artist is playing one of your favorites. These are local or regional artists as well. You never know – among them could be someone you know. Who are some of these musicians who perform at our farmers market events? With the level of skill involved in playing the harp, finding one is a challenge. But finding one that performs is an even greater challenge! So we’re quite fortunate to have one in our talent pool! 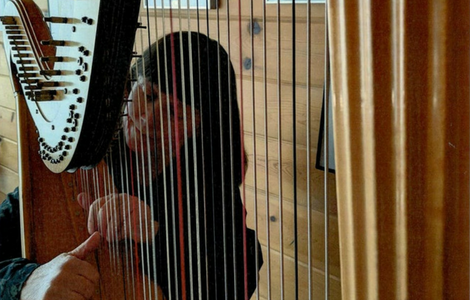 Allison draws from classical, Celtic, original and contemporary tunes, she keeps the mysteries and romance of the harp alive while engaging and entertaining everyone. Who doesn’t love oldies, Motown, country or folk tunes? These are the musical areas Dana-Marie features in her sets. Her playful, lively, quirky, and beautiful delivery charms the hearts of listeners of all ages. She embraces many genres of music and includes such variety as Johnny Cash, Patsy Cline, The Everly Brothers, The Platters, Queen, Neil Young, Bob Dylan, Pink Floyd, CCR, Bob Marley, just to name a few. Listening to a guitarist who sings is a special treat. Jeff happens to be one of these. The material ranges widely from sentimental older standards up to spicy gritty and weird. There is a variety of instrumental music from Tango to fiddle tunes. Jeff will be sure to please your ears. From what we’ve learned, Jeff is what many would call a smart dresser, so we guess he’ll be pleasing to your eyes too! On Sunday, June 10, the featured artists will include “Larry’s Brother”, as well as “GoRdo”. Good, fresh, farmers market produce will be there. Talented artists will be there to perform for all who visit the event. There’s only one question you need to answer: Will you be there?